The relationship between the BBC and successive governments since its creation in 1926 has been characterised by antagonism. Between this time and 1979 various governments, regardless of Party, have attempted to limit the perceived power and influence of the Corporation. I believe the aim was to either make the BBC subordinate to government or, more realistically, to weaken its ability to operate relatively independently and autonomously from government. 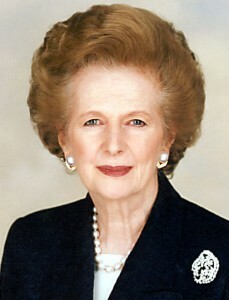 In 1979 and with the first term of the Thatcher administration, however, a fundamental change in relations occured. Whilst it is true that conflict between government and the BBC reached unprecedented levels, I would say the period is notable because for the first time the very existence of the BBC as a publicly funded organisation was questioned. In order to understand Thatcher’s attitude to the BBC it is necessary to understand her political philosophy. She was intent from the outset of her Premiership to lessen the regulatory role of government, to reduce social spending (on health, transport, and education) and to reduce reliance on the Welfare State. These policies were pursued in tandem with a determination to roll back public ownership through the process of re – privatisation. In total, £30 billion pounds worth of state owned industries were sold off by 1990. The philosophy was – less government and less economic interference, both in public and private sectors. What happened was the attempted disassembling of the “politics of consensus”, which had existed since 1945. Governments up until 1979, whether Tory or Labour, had maintained a broad commitment to the continuation of public ownership. The election of Thatcher’s government saw this gradually change. As a public institution the BBC was an anathema to Thatcher. It stood for all she disapproved of – it did not embrace the free market, enjoyed the benefits of a fixed tax system and provided no financial gain to compensate for the huge awards of public money. Furthermore, she believed that, at journalistic and management level, the Corporation was inhabited by individuals dedicated to left wing politics and antagonism toward the government. The BBC was not allowed to operate as had done in previous decades. “Rupert Murdoch’s News International was a shining example of the new age of enterprise Mrs Thatcher had ushered in. It was union free, dedicated to giving the punter what they wanted and hugely profitable. Murdoch’s papers had cheered on the Prime Minister all the way and savaged her critics, including the BBC. Murdoch had always been one of the Prime Minister’s favourite businessmen and now the publisher…..flew across the pond to join the Prime Minister for a select [10th] anniversary dinner at Chequers.” (Horrie and Clarke, 1994, p159). There is little doubt that most of the British press gave open and widespread support to a wide range of policies adopted by the Thatcher governments of the 1980’s. Broadcasting was no exception. Sections of the press expressed opinions and forwarded policies that mirrored those held by Thatcher, her Cabinet, her advisors and pressure groups in regard to the restructuring of British broadcasting. It was the Murdoch owned press, however, (The Times, Sunday Times, Sun, News Of The World) that was her closest ally in attacking the BBC – since News International had a commercial interest in a change in the broadcasting system. Thatcher opposed the BBC ideologically, while Murdoch was interested in a solely commercially funded media. Thus, in order to attain a major footing in British broadcasting, Murdoch needed to attempt to weaken public service broadcasting. Every opportunity to criticise the BBC was seized upon – with Murdoch using his substantial media concerns in this country to support the Prime Minister, while his companies received direct benefits as a consequence of policy decisions taken by her government.